So I spent my Friday night and Saturday morning re-arranging my polish shelves! I know right, party animal!! You're so jealous, I can tell. So anyway.. 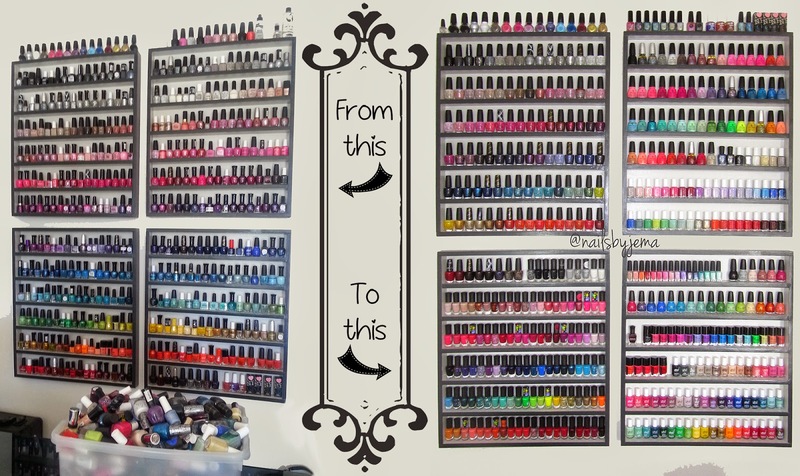 This is how I was displaying my polishes originally. Simple rainbow spectrum that I arranged by my swatch sticks and how they look out of the bottle. It was sometimes annoying because sometimes a polish can look a lot lighter or darker in the bottle so when they were on my shelves a few of them looked 'out of place' even though they were arranged correctly by swatch colour. I love the rainbow and I think it's really striking and easy for nail art when you need something that's lighter or darker than the colour you have but having so many brands it can look 'messy' to some people and also I didn't have enough space to continue to display them that way. Notice the big box on the table full of polish? All extras that needed to go on the shelves. So I decided I was going to display my more 'high end' polish and some of my more favourite indies and drug store brands and keep my less used and less favourite (but still totally necessary for colour variation) brands in drawers. I want to get a Helmer from Ikea as soon as possible but in Australia they are $100 (which is actually cheap seeing as they just got reduced from $130!) and I just can't afford a set of drawers for polishes I can just keep in a box for now. And here are my shelves now, sorted by brand! On my top left shelf I have my O.P.Is and sitting on top I have my Konad stamping polishes. OPI is one of my all time favourite brands but at $20 per bottle in Australia, it's hard to afford because even from online stores, shipping it a KILLER! The top right shelf has my Emily de Molly, Bliss Polish, Lush Lacquer (now Polish Me Silly), Ozotic and ILNP polishes sitting on top. Inside are my China Glaze, Zoya and Essie. 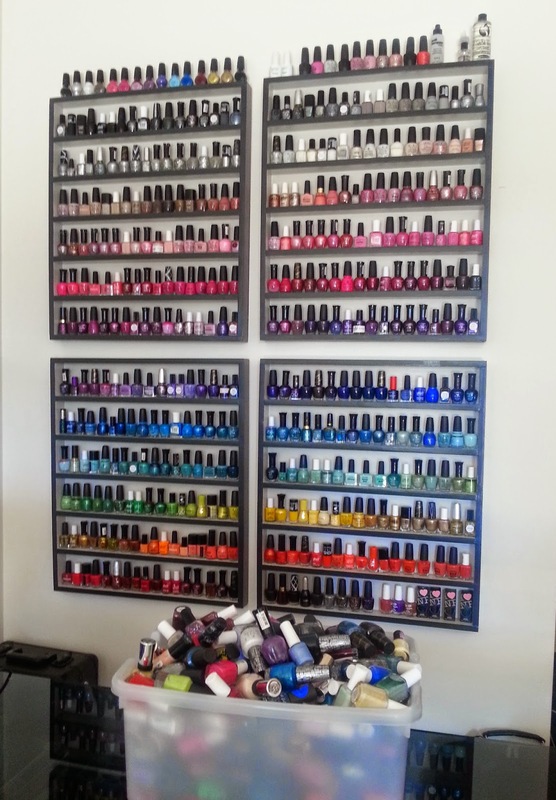 I have another 25 China Glaze on their way to me so this shelf won't look like this for long. It's going to be a huge pain to reorganise when they get here because I love it like this. The bottom left shelf has the rest of my OPIs and my L.A. Girl collection. The polishes are a rectangle shape and take up so much room when faced to the front so I turn them on their side to fit twice as many in. It doesn't bother me that I can't see the polish label because I can see the colours through the glass. And finally in the bottom right shelf are my Picture Polishes (turned to the side to save space), Sinful Colors, Deborah Lippmann, Australis and Ulta3 polishes. Australis and Ulta3 are great Australian polishes that are super cheap and great quality (Ulta3 are $2 each and Australis are $8). I still have about 300 polishes I can't display (Sally Hansen, Rimmel, Maybelline, Revlon, Covergirl, etc) so they will go into the Helmer when I get it. For now they're just in the plastic box most of these came out of. I'd love to eventually make up a few more shelves but where they are now on the wall there really isn't enough space for them to be put up so once we move houses and I can have a spare room for my polishes and makeup I will make sure I can make more to display them all. I know a lot of nailies prefer to store them in drawers but I love having them on display like pretty little usable art. Hope you like my display and let me know in the comments if you prefer this way or sorted by colour like the original way I stored them. Also, let me know if you want the post about how I made my shelving. OMG! I want!!! :) Would love to see how you made the shelves, my collection is getting too big for the case I keep them in!